Today’s reading describes the creation of Eve and remains the basis for the Christian theology of marriage. No matter where one stands on the literal truth or application of the Genesis tale, it has certainly been a fertile subject for artists. 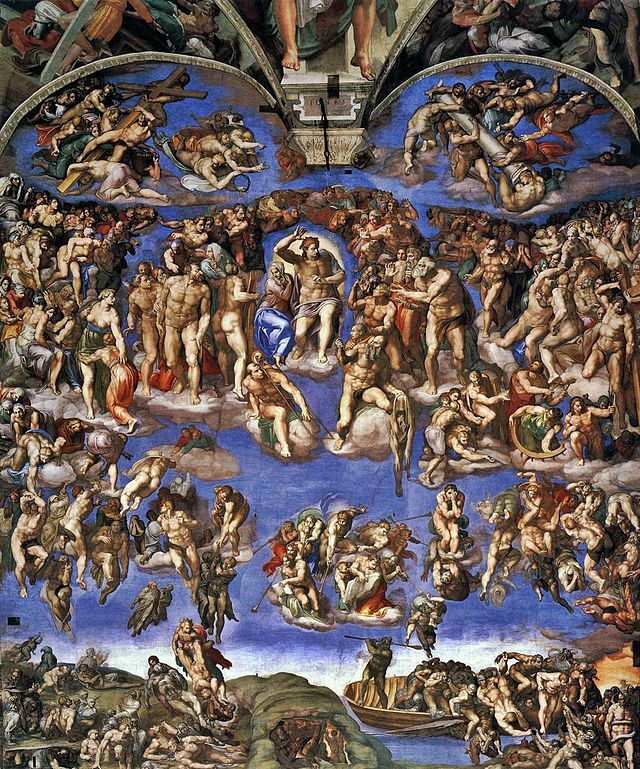 The most well known image of the creation of Eve is undoubtedly that by Michelangelo in the Sistine Chapel, shown above. 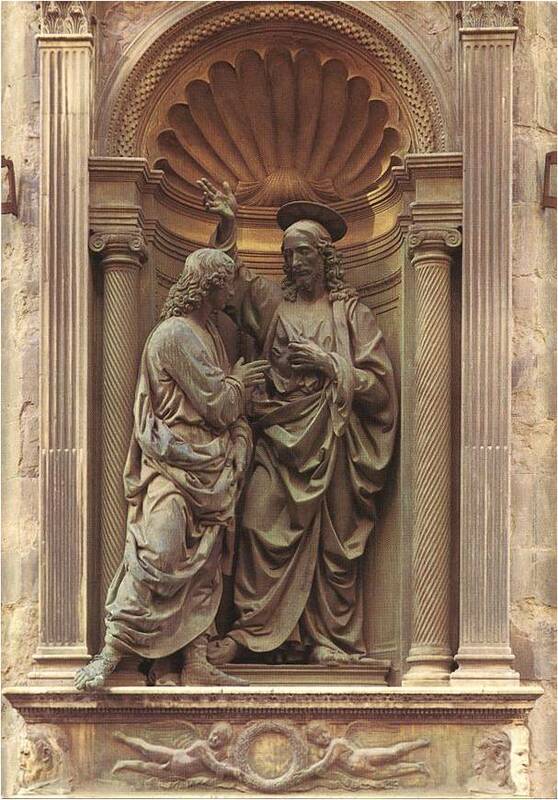 The relief sculpture above is from the west facade of the cathedral at Modena. 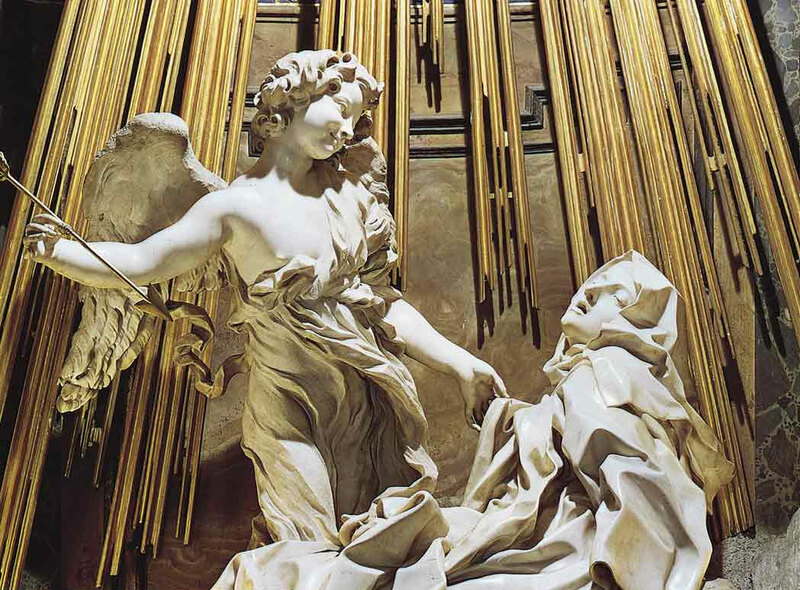 It was sculpted by the Italian Wiligelmo, who brought life-sized sculptures to Italy in the Romanesque Period. The scenes are sculpted in high relief, with Roman arches and columns behind. We can see the stylistic quirks of the period, such as the unnatural body proportions and lack of naturalism. 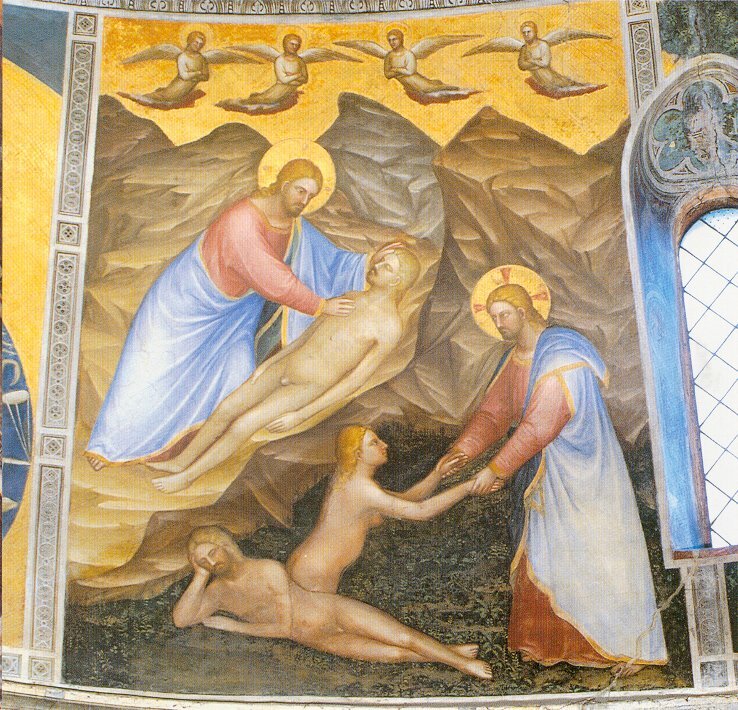 At left, we see Christ in a mandorla supported by two angels. 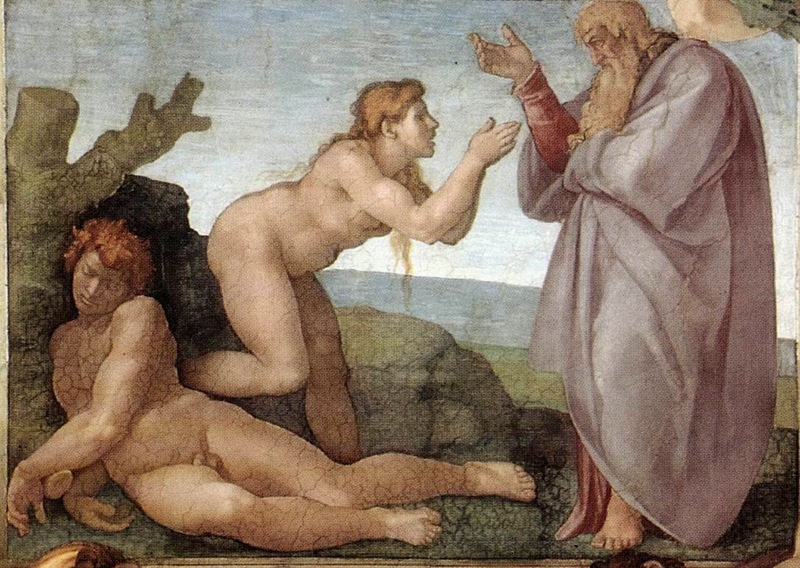 To our right the next scene is the creation of Adam, followed by Eve’s creation from his side as he sleeps. Finally we see the pair with the tree of the temptation. 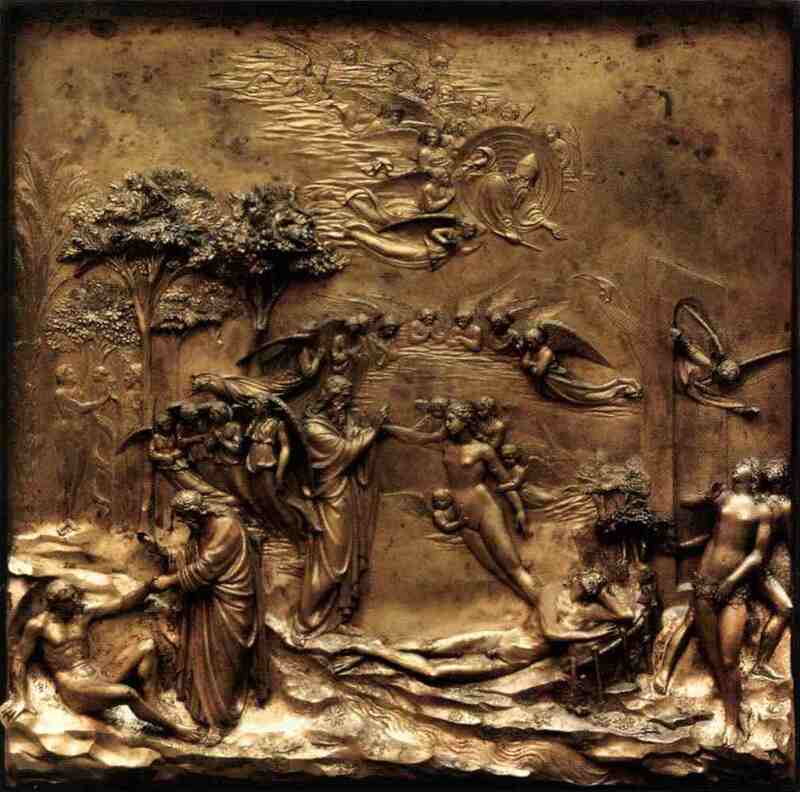 Creation of Adam and Eve from Gate of Paradise, Lorenzo Ghiberti, 1425-52, gilded bronze Baptistry, Florence. “Created in the mid-15th century and installed in the eastern portal of the Baptistery, the Gates of Paradise have been praised by generations of artists and art historians for their compelling portrayal of scenes from the Old Testament. Over time, the seventeen-foot-tall, three-ton bronze doors became an icon of Renaissance art and a touchstone of civic and religious life in Florence. 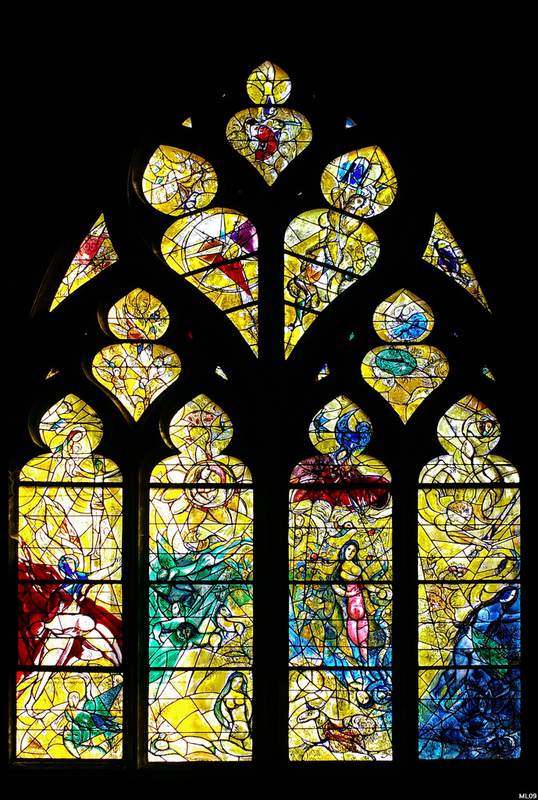 This exhibition showcases three panels from the left door of the Gates of Paradise, which depict the stories of Adam and Eve, Jacob and Esau, and David and Goliath. The exhibition also includes figures and heads of prophets from the doorframe, and it explores the evolving nature of art in Florence and Siena during Ghiberti’s career with works from the Art Institute’s permanent collection. 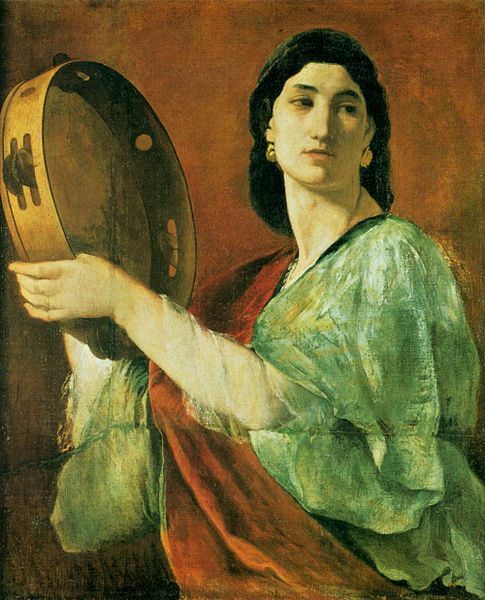 Menabuoi was a 14th century Florentine painter mentioned by Vasari in his Lives of the Artists. 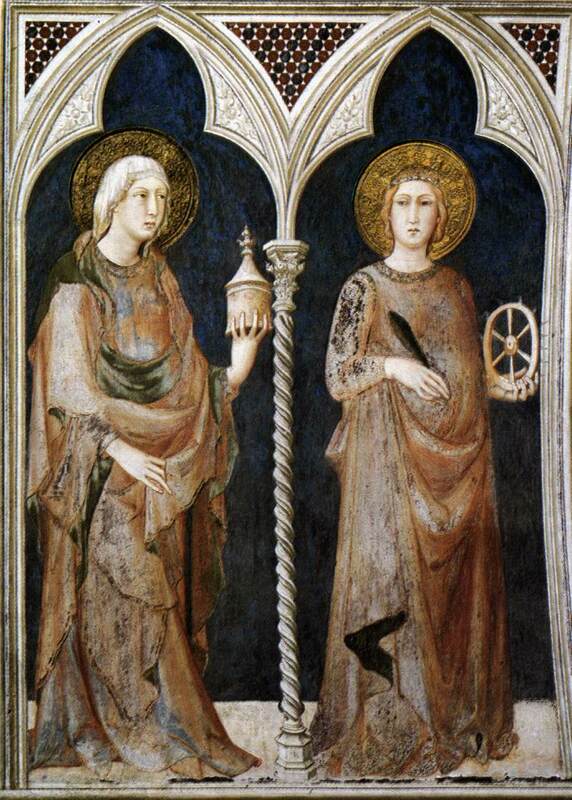 His frescoes in the Chapel of S. Giovanni in northern Italy’s Padua were executed between 1376 and 1378. 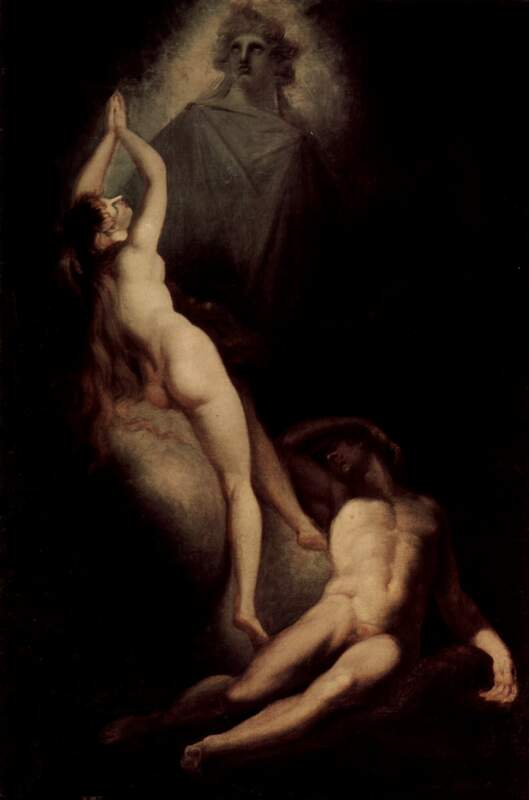 Created for his gallery of images illustrating Milton’s Paradise Lost, Fuseli’s Creation of Eve shows her rising from Adam in the conventional manner, but with an ambiguous image of a man in the upper right. Is it God? This work apparently created some theological controversy. Much of Fuseli’s work is known for its surreal, supernatural content. 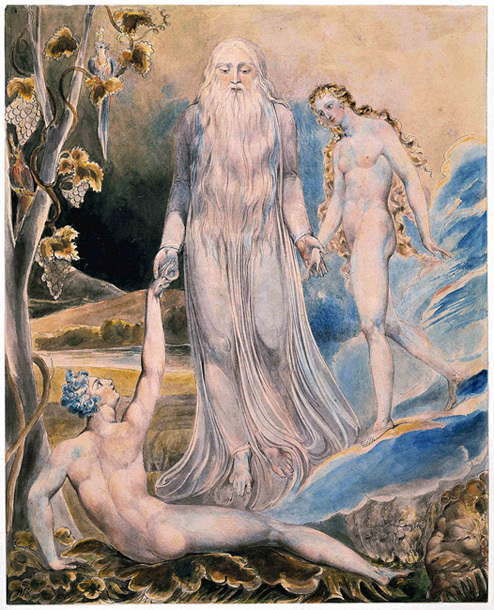 Angel of the Divine Presence Bringing Eve to Adam (The Creation of Eve: “And She Shall be Called Woman), William Blake, 1803, Watercolor, pen and black ink over graphite, Metropolitan Museum of Art, New York. 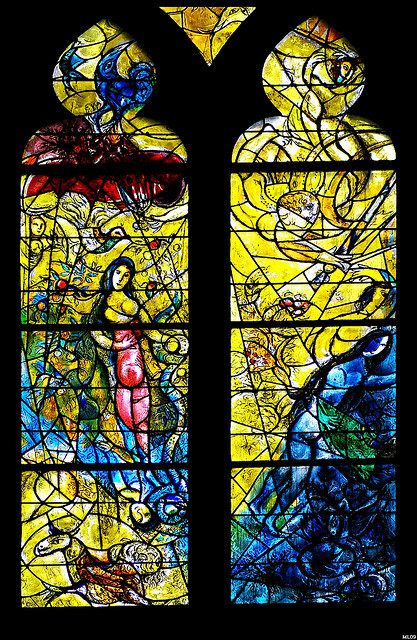 From the Met website: Blake considered the Bible to be the supreme poetic work and here evocatively re-imagined the Old Testament theme of the creation of Eve. Instead of showing the first woman emerging from Adam’s side, Blake presents the couple meeting with ceremonial solemnity. A divine figure prepares to join their hands while a recumbent Adam looks up eagerly as his mate steps down from blue-tinged clouds. Objects in the landscape elaborate the meaning: the grape vines entwined around the tree symbolize marriage; the exotic red and blue plumed birds represent the newly created souls; and the giant oak leaf on which Adam reclines forecasts humankind’s suffering. 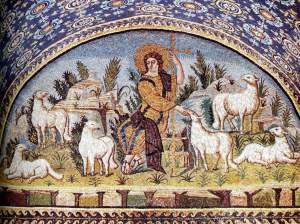 A lion dozing near grazing lambs at lower right signals the peace of the pre-fallen world. Blake made this finished watercolor for his loyal patron Thomas Butts. Many (most?) of us would probably have to admit that our natural inclinations often lead us to harsh judgments of our fellows rather than merciful love. In the Sistine Chapel we can experience the tension between these poles as we stand between two works of Cosimo Rosselli, a Florentine artist of the fourteenth century. 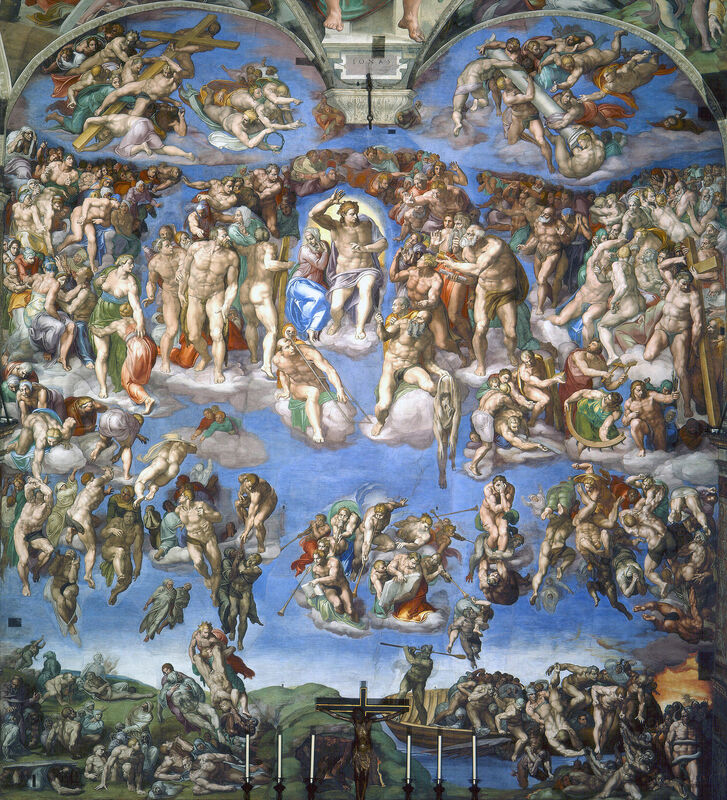 Long before Michelangelo was commissioned to paint the ceiling of the chapel, Rosselli was hired to decorate the walls of the chapel along with Botticelli, Perugino, and Ghirlandaio. Rosselli painted parts of a cycle on the north wall depicting scenes from the life of Christ (the Sermon on the Mount and the Last Supper) and the life of Moses on the south wall (the Crossing of the Red Sea and the Tablets of the Law with the Golden Calf). For this post we will look at the Sermon on the Mount and Tablets of the Law. In The Tablets of the Law with Golden Calf, we several scenes juxtaposed. 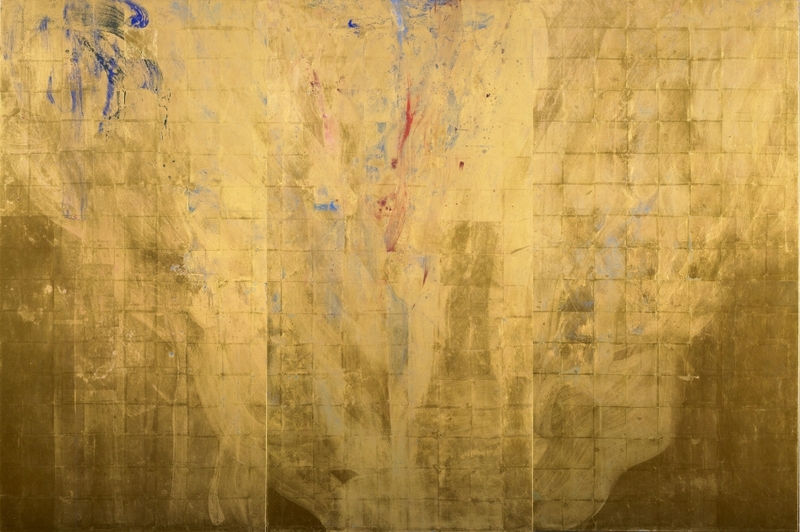 At the top, Moses appears on Mount Sinai as he converses with God, who appears in a fiery cloud surrounded by angels, while Joshua sleeps below. At the left, we see Moses bringing the tablets containing the ten commandments to the Israelites, whose camp can be seen in the background. In the center, Moses is about to smash the tablets when he sees the altar with the golden calf that the people have built and worshipped in his absence. Finally, at the right in the small inset scene, we see the idolatrous people being punished. 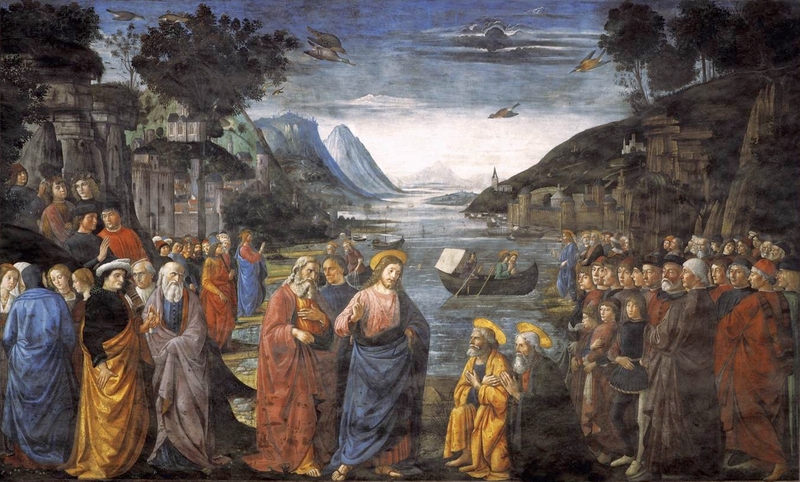 Sermon on the Mount by Cosimo Rosselli, 1481-82, Fresco, 349 x 570 cm Sistine Chapel, Vatican. 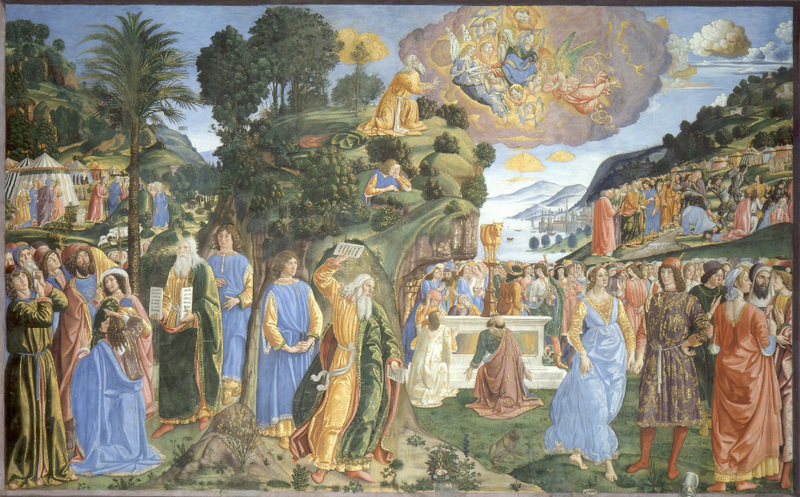 In the Sermon on the Mount, placed directly opposite the Moses painting, Rosselli used a similar compositional arrangement to emphasize the comparison between the two scenes from scripture. 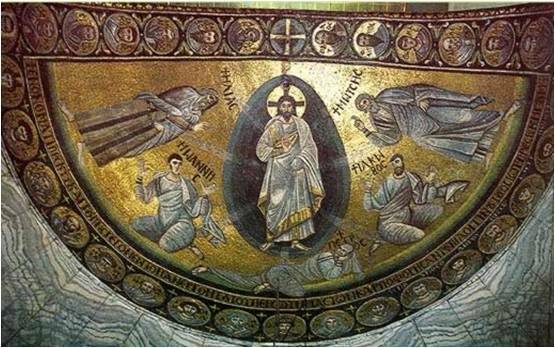 The mountain scene at the center top is now occupied by the Church, the place where God can now be found and from which see the figure of Christ coming down towards us. 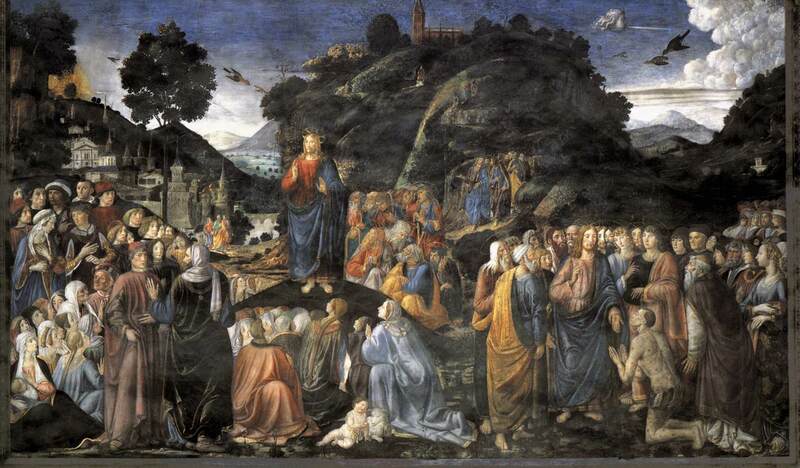 At the center of the painting, Christ delivers the Sermon on the Mount to a large crowd at left, while the Apostles huddle behind him. At the right we see Jesus curing a leper. Standing between these two works in the Sistine Chapel, you are meant to be reminded that you are standing in the Church that carries the continuity between the Old Law given by Moses and the New Law as represented by Jesus. But it is also a challenge to us. We are caught in the middle between the old law of harsh judgment, which is our natural inclination as fallen human beings, and the new law of love and mercy. In the Sermon on the Mount, Christ makes it clear which path we are to choose if we seek the Kingdom of Heaven. 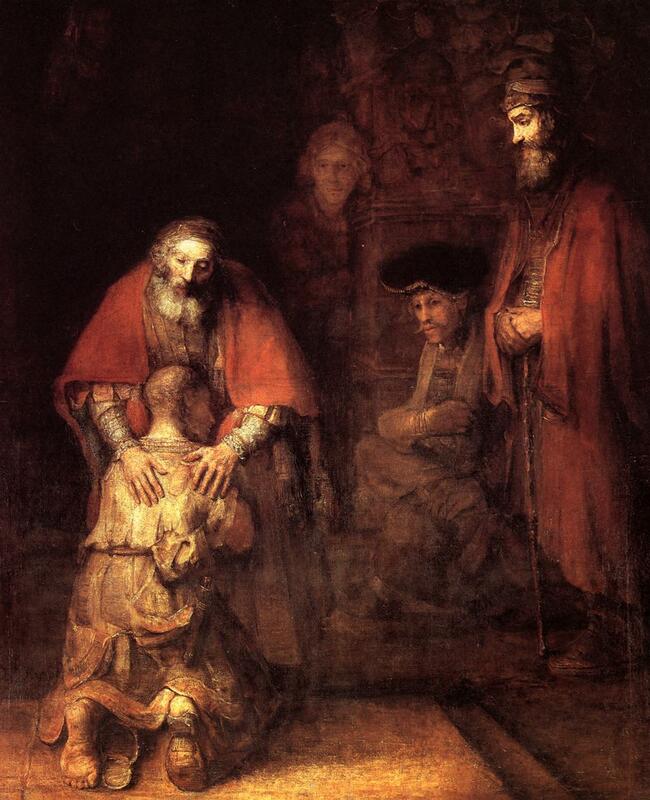 In Rosselli’s paintings we see that the old law leads to punishment while the new law brings healing by Christ. Which path will you choose?